Bill’s Ranch is located just southeast of the Peak One site. Local historian Mary Ellen Gilliland recounts the following story in her book, Summit, a Gold Rush History of Summit County. 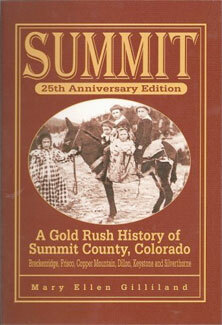 Check out: SUMMIT, A Gold Rush History of Summit County Colorado by Mary Ellen Gilliland. Available at local bookstores or by calling the publisher at 970-468-6273 and at http://www.alpenrosepress.com.